We know what some of you will think of us. We've heard it from our colleagues. FarmVille 2? Really? You're playing that? We are. And we're enjoying it. Can't deny it. The three offenders on the staff are me, Kirk Hamilton and Mike Fahey. We've discovered that this game, like its predecessor, really does compel people to prattle on about their farms. The rest of the team just humors us or asks us to shut up. Stephen: I spent the other $20 on 115 Farmbucks. That was way more worthwhilte. Except... it turns out that most of what you can buy, in terms of farm decorations, has no gameplay effect. it just gives you tiny bits of XP, but isn't worth it. maybe it appeals to players who like to decorate, but it's useless for getting ahead. Mike, what I'd LOVE to know is how to get more milk bottles for my baby animals without having to beg friends! Stephen: is there no way to farm them? Kirk: but yeah when an animal "prizes out" I pretend that it's the same as on a real farm when an animal "dies"
Kate: this might be the most amazing conversation I've ever witnessed in Camp. And it went on and on for a bit as I ranted about how FarmVille 2 treats the milk bottles earned from having goats as different from the baby milk bottles needed to raise new animals (I also ranted about this out loud in the New York office, to Evan, Tina, Jason and Chris' chagrin). We're investigating... A bunch of us got curious about a game that we assumed would be popular/important, so we started playing it. One of my discoveries, as you can see in the exchange above, is that you actually can't pay to win. Paying money barely nets you any progress, at least not in terms of leveling up and out-farming/earning other players. Paying money is only good for getting decorative items for your farm, something I don't think any of us cares about. This discovery shocked me and has changed what I think of how Zynga games work. We're working... I volunteered to review it for the New York Times, so I was compelled to play it for a couple of weeks. So Kirk will send me e-mails that have pictures like this, just to show off. We're in a FarmVille 2 throwdown! And it fits well into our lives and between all the other games we're playing. The time commitment for the game is so low, that it's easy for me to dip back in, push my game ahead for a few minutes, and then hope that my good planning will give me something to taunt him with a few hours later. This flow is actually very good, and I'd love to see other games adopt it: minimal time-commitment + maximum opportunities to be competitive with friends = sustained interest and a lot of fun. StephenTotilo: (3:22:49 PM) what the hell? StephenTotilo: (3:22:54 PM) you have to beg people for them? Kirk Hamilton: (3:23:18 PM) ! Kirk Hamilton: (3:23:31 PM) that the game is saying, "Come at me bro"
StephenTotilo: (3:23:57 PM) this is an outrage! 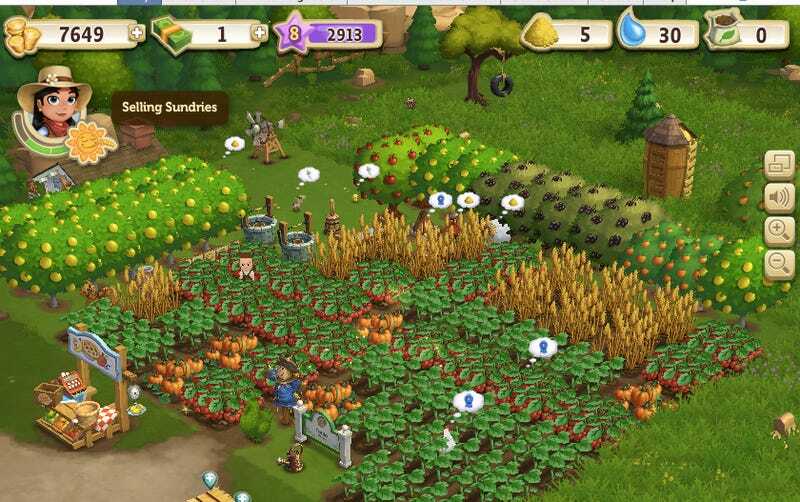 Finally: Can't judge a man (or men) about their FarmVille 2 playing unless you've played. A good test of that will be if you can discern which huge blunder I made while playing the game, as seen in the image at the top of this page. And no, it's not that I played FarmVille 2 at all!